My last day working for “the man” was two weeks ago. I am officially free. What a beautiful word—free. I wish I could say I am completely retired, but I still need an income stream. Rather than going to work every day though, I have now become my own boss as I open my guest house in Ecuador, South America. I have been in search of freedom since the first time I toured a 24-acre farm that was for sale in the subtropics of Ecuador back in 2002. It was love at first sight—lush, rolling green pastures surrounded by huge ravines, and snow-capped mountains in the distance. It was one of Mother Nature’s finest works of art. I bought that farm and I had two years of savings to tide me over until I found a way to stay for good. I began the journey to make an income. Over the next 17 years, there were dairy cows, a fruit tree plantation followed by the planting of 6,000 coffee trees and none of those projects made enough to even cover my farm hand’s salary. In order to finance those ventures and put food on the table, I began a double life. Not the scandalous kind with two husbands, but rather two countries. I lived six months of the year in Ecuador and six months of the year in the States where I worked as a Physical Therapist. As far as jobs go, it was pretty good. The first time someone walks after recovering from an injury or an illness is something that chokes me up every time. It was still a job though. It came with rules, bureaucracy, and a 9-5 schedule. It felt confining. It always left me thinking there had to be more. The other six months of the year I was experiencing one adventure after another as a machete-carrying Gringa who spoke broken Spanish. Back then, I didn’t know about Financial Independence (FI). But, working full-time in the U.S. for 10 years to get to FI was not an option. I couldn’t leave my home, my animals, my friends and the life I loved for that long. I lived more in one week on the farm than in six months in the States. The farm was my “why” and it gave me the motivation and drive to find a way to stay. I always thought about hosting retreats and sharing Ecuador with others. I was into finding out what made us happy and I was a self-improvement junkie. As part of the retreats, I envisioned a guest house on the last pasture of my property. There was a stunning 360-degree view in that pasture. I put that dream away because I thought there was no way I would ever have the money to build such a house. However, I could still host retreats staying at other venues around Ecuador and that is how I stumbled into the FI world. Jim Collins, aka jlcollinsnh, contacted me about being a speaker at one of my retreats. He could add a financial component. I asked myself, do finances and happiness really go together? I wasn’t sure, but I always opened every idea door that was presented to me. That is how the FI Chautauqua’s were born. Six people agreed with that coolness factor and contributed. The plan changed a bit and it ended up turning into a guest house on my last pasture. Yes, the one I thought I would never have the money to build. Some dreams never die. I combined those donations and made a sacrifice by working longer in the U.S. My plans for a tiny guest house morphed into a five-bedroom, true sanctuary. I am now free, on my farm, surrounded by my dogs and cats, planning wonderful retreats and trips for people to share in the beauty and peace of the farm. This voyage of living in two worlds and spending time alone in the middle of nowhere came with some life lessons that are very applicable to the FI world and the world of humans. Don’t wait for retirement to be happy. Happiness is a state of mind, not a destination. If you weren’t happy before retirement, you won’t be happy after. I lived in paradise, but paradise ain’t paradise if you don’t feel like it on the inside. I needed to do a lot of reading and working on myself to improve my happiness levels. Check out Marci Shimoff’s book, Happy for No Reason and Sonja Lyubomirsky’s The How of Happiness. They can show you how to do that. There is no perfect life. You may be thinking, wow, what a dream life living on a farm. (Or fill in your idea of what would be a perfect life.) We all secretly hope that if we lived in a specific place or had some great side hustle, that everything would be perfect. There are a lot of great things about my life and I love it immensely, but the farm is in the real world. Sometimes the power goes out for a long time. I can go for days without much human interaction. I am exposed to a lot of poverty and sadness. Life will always bring you challenges. Retirement will not be without problems. Work won’t be one of those problems, but there will be others. Find the things that make your world make sense. It’s different for everyone. The farm gave me a gift in showing me that I loved the outdoors, the views, and to write. My life needed to include animals. I needed to have projects to work on. I needed to help others. I would be very sad if I lost the farm, but each of those things can be replicated somewhere else. Find out what you are passionate about now and start incorporating those things into your life. If I had to do it over again, I would have participated in life more while in the States. I should have been around animals. I should have gone outside more. I should have volunteered. Look into what you love to do, and start doing it. Don’t postpone living until that magical day of retirement. Sitting in a hammock is fun for a few days, but not for the rest of my life. It didn’t do me or the world much good. I needed a purpose. My first purpose is sharing Ecuador with others. My second and greatest purpose is to be of service. Here on the farm, I saw poverty every single day. As I built my amazing guest house, I watched my neighbor walk by with his donkey to bring supplies from town to his no electricity, no running water home. Right next door. It felt overwhelming sometimes. Many years back, I started my own sort of foundation to make the world a little more even. I call it Project One Corner. I help one person or one family at a time in my little corner of the world. Ten percent of any money I make in Ecuador goes directly to fixing houses, buying motorcycles so someone can get to work, or paying education costs. Giving people opportunities and basic human rights. And it just so happens that in the happiness research, helping others contributes to happiness. And finally, keep working towards your dreams. Open every door. You may not know how your dreams will be accomplished, but they never will if you don’t define them and keep taking steps towards achieving them. The path to those dreams is exciting, challenging, and worth every step. Wow. You have such a great story! I think I’m going to find myself in a similar situation in a couple of years from now. My girlfriend and I are looking to take advantage of geoarbitrage and travel the world in chunks at a time. It’s always refreshing to hear from people who have actually made this lifestyle happen. Thanks Cody! Good luck with your plans for geoarbitrage. If I had one piece of advice it would be to live with the locals rather than in an ex-pat community because it changes you as a person. I love the story and the double life it took to get where you are today. Finding happiness for all of us takes a different path and creates a different story, yours is remarkable in many ways thanks for sharing. Thank you Steven! You are right that everyone’s path to happiness is different. I know my paradise might not be so dreamy for others. The best part of my story has been living it! Cheryl, attending the Chautauqua in 2015 changed the course of my entire life for the better. I experienced a lot of growth on my adventurous trip and made some life long friends. You have made a difference in the world and I am so happy I met you. Next stop? Gwen in the guest house! Thank you Miss Gwen! I am happy that you had such a great experience and that it made your life better. I can’t ask for anything more than that. And many of my favorite memories of the Chautauquas are with you in them…….the Shaman, Playing Cards against Humanity with the group of ladies and both of us looking up at the same time to see Kevin dancing. So much fun! I have a room at the guest house waiting for you! “But I always opened every idea door that was presented to me” – and look what happened! Can’t walk through if you don’t open it. 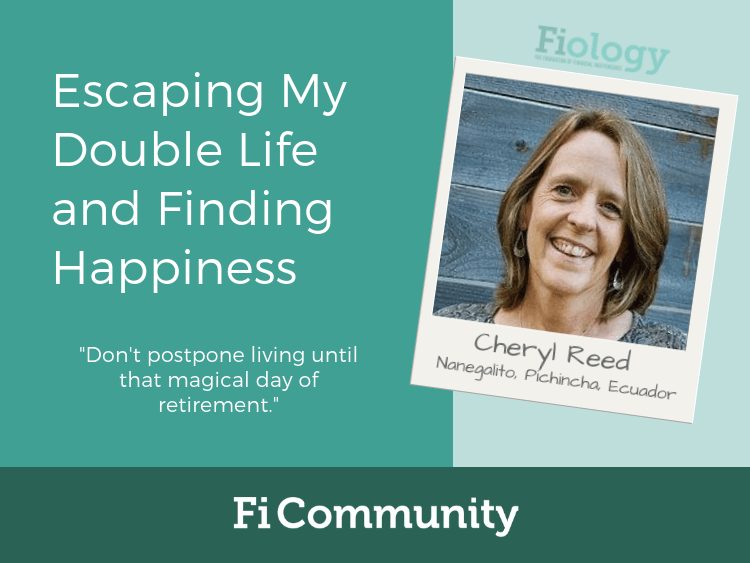 Nice to read your story Cheryl and thanks to you and Jim for your contributions to the FI community and the Chautauquas. I have heard only positive things from people who have attended them. Yes, every door. You never know what could be waiting for you! I am glad you have heard positive things about the Chautauquas, as I have about Camp FI! It has been my absolute pleasure to host them and to meet so many great people. Thank you Stephen! Cheryl, I have goosebumps as I read your story! It’s so wonderful! It’s a unique journey and you’re a great story-teller. I feel like I could sit and talk with you for hours. And I will forever remember my last day in Corporate America (March 25th, 2008)… it was a pivotal moment in my life so I remember how these first few weeks feel. “Free” is a great word! Congratulations on living your dreams and escaping your double life! Thank you for the kind words, Kelsa! Maybe some day our paths will cross and we will get an opportunity to sit and talk. Congrats on being free also!!! Cheryl, your amazing story is about changing the world in multiple ways; your life, the live of those around you and the lifeblood of the FI. Truly amazing. Thank you, Kevin. I read your story and you are doing your own part in helping the world and the FI community also. I think you could turn your motto of “One house, One spouse” into a bumper sticker. I love it! Congrats on achieving FI. Cheryl, so pleased that we have been able to hook our dreams to the same wagon from time to time. Excited to bring your first group of guests to the guest house and build a labyrinth on the farm! I am happy about that too, Jay! I can’t believe you will all be here in three weeks! My first group to inaugurate the house. You are going to make the guest house even better with an amazing labyrinth. Hi Cheryl, I can’t wait to meet you in a month, as a member of the first group to your guest house that Jay talks about above. I am a self-help junkie as well and I look forward to sharing notes with you! I’m very excited about enjoying the beauty and surroundings that you have incorporated into your dream and so graciously share with others. I am looking forward to living the dream as a part of your first guest house guests. Like Jay I do some writing and I look forward to the creative thoughts that flow from the farm. Wow this is brilliant advice. Thank you for sharing your story and journey. I don’t think anyone could have said it any better. Others will be better for it.